Big players are busy buying existing distressed assets even if their cost of capital is reasonable. No major aggregate capacity addition. Cost of capital is not a major advantage in steel. In Indian context access to raw material is a major differentiation. Promoters recently infused 50 cr. (25% of upfront money against warrants). I am wondering where from they got this money and where from they plan to pay remaining 75% amount. Company doesn’t give any dividends. Promoters slalary is not that much. Do they have any other business or income source.?? If they have that much money why don’t buy directly from market?? Or lend to company for repayment of outstanding loans and remove pledge of shars?? QIP - This is higher cost fund raise and given the past issues would have been difficult to raise money. They must have got feedback on the same. Their FCCB had also some issues. Promoters’ own funds - If he has lots of cash, it would have made more sense to fund it through debt but I doubt he could arrange couple of hundred crores in one go. The best option is to do through warrants as money is needed over time. Please keep in mind that PI is also generating lots of cash from its ops. His calculation of market rewarding its share price due to steel upward cycle and demerger has gone wrong due to the factors not under his control. I think the company needs a white knight like Edelweiss to bail them out of this situation. Why did promoters exercise warrants at 210? Shouldn’t they have bought from open market and let the warrants expire? I do not feel that there is any bail out situation for this company. If you compare the last 12 quarter results there is an overall improvement at every level i.e Sales, Margin, Net Profit, Cash flows. I just cannot understand that why we tend to compare the performance of the company from the Share price. The value a stock carries is independent of market price. The company has only improved its performance during the last 2 years and looking the steel cycle it will continue to do so for another 2 to 3years. I had already advised that the company is having some legacy issues on corporate government and which haunt the investors in future also. If you can digest this fact then only you will see value in the company . I have analysed corportate governance issues in detail in my previous post. Can we imagine any 100% ethical person running a small size Iron and Steel Industry in remote area of Chhattisgarh in late 90s. Its a 100% fact that more then 50% of Iron and steel business (before GST) accross India was being done in Kacchha 9without paying tax). In a corrupt system can you imagine getting an Coal or Iron ore mine without any manipulation. I am not favouring the promoters but we will have understand the prevailing situation at the material time. The promoters have ploughed back the money in the company and because of which it has shown growth in its capacity even during the time when the steel Industry was in recession and when even big steel companies have failed. (Essar, Bhushan, Monet, Electrosteel,etc). In my opinion the the management has passed the biggest criterion of Corporate Governance which is that it has successfully come out from Steel recession cycle and at a time when it was loaded with corporate governance issues, Coal block de allocation, Syndicate Bank Bribery case,CBI enquiry on allocation of coal block,FCCB default etc etc. Disclosure: Invested with substantial exposure and very much confident about the company and the capability of management. Agree, Ethics and profits are two different things altogether, even honored Tata’s have a grey reputation from Telecom and now Aviation scandals, Mota Bhai of Reliance fame is an exceedingly good cook of books (and bonus guru), to make even Jio turn profitable! A *big enough crook* is equal to Royalty, while the middling ones are treated with disgrace, at least, well, till they make it big. Prakash management seems to be of exceedingly “good quality” for reasons very well described by VALUE2017. They managed 3x PAT on YoY basis, with great future outlook, yet share falls of cliff! Well, Simply More to grab till the party lasts at PE of ~3.5! EV/EBITDA is also low @4.5 compared to worse performing peers, mostly above 5.5. ROCE has improved tremendously to around 20%, was never quite low. Cash flow is positive, 2 years now. And the cycle will last years. Discl: Was watching for some time to up stake, did it today, now 5% of PF. 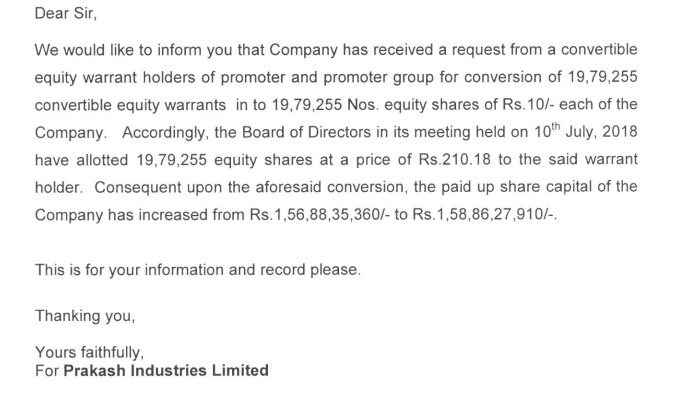 Promoter has converted warrants into shares. Great news. Could you please advise source of information. What could be the reason for not paying tax (last year it was hardly 2 cr on 188 cr profit)? This worries me as they have cash too. Disclosure: invested a year ago (2% of portfolio). Thanks, it answered by question. They are claiming MAT credit and hence lower tax payments. Sorry guys I posted a message forwarded to me about a reco by an individual investor I thought by any individual investor investing in a particular stock cannot change the fundamental or business prospects overnight. 29 from 4,486 in the previous trading session. Historically, Steel reached an all time high of 4772 in December of 2017 and a record low of 1750 in February of 2016. Promoter is regularly releasing pledged shares.